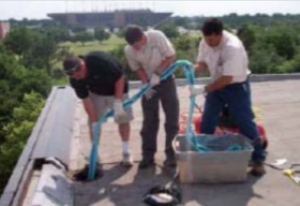 Description: Rice University’s Anderson Hall, biology labs for Rice’s Wiess School of Natural Science, had a drainage problem that required immediate attention. A leak was detected on a 4-inch welded steel storm drain line running from the roof to the ground between a brick and cinder block wall. Conventional replacement of the line would have necessitated carefully removing the brick fascia of the building’s exterior to access and replace the line. TDT Plumbing utilized ACE DuraFlo®’s new “trenchless” technology to repair the Rice University 4-inch, storm drain riser in-place. Rice University was founded in 1891 by Houston entrepreneur William Marsh Rice and held its first classes in 1912. Currently, the university is actively involved in collaborative research programs with the Johnson Space Center (NASA), the Med Center, and Houston’s energy and technology industries. And it was in Anderson Hall, biology labs for Rice’s Wiess School of Natural Science, that a drainage problem required immediate attention. 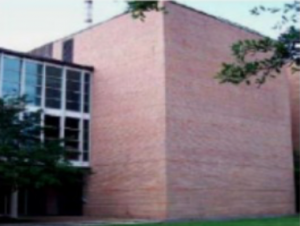 A leak was detected on a 4-inch welded steel storm drain line running from the roof to the ground between a brick and cinder block wall at Anderson’s Biological Laboratories. A large hole (3â€ + in diameter) was located in the pipe. Water began migrating from pipe’s interior to its exterior via the massive hole. The migratory water would pool in the basement as a result. Conventional replacement of the line would have necessitated carefully removing the brick fascia of the building’s exterior to access and replace the line. This option was both time-consuming and uneconomical.